Available from all good bookshops and probably some bad ones too. 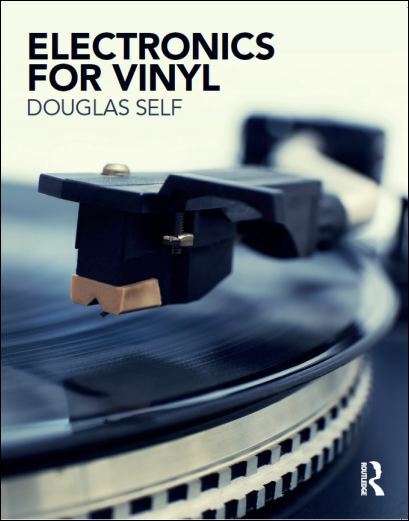 Electronics for Vinyl takes all of the vinyl-related material in Small Signal Audio Design, 2nd edition and adds to it twice as much again of new material. The book is available from any big bookshop, or Amazon, or direct from the publisher: see links at left below. A whole chapter on integrating phono amplifiers into a complete preamplifier. A complete chapter on the tricky business of getting really accurate RIAA equalisation without spending a fortune on expensive components. Includes switched-gain MM/MC RIAA amplifiers that retain great accuracy at all gains, the effects of finite open-loop gain, cartridge-preamplifier interaction and so on. A complete chapter on noise and distortion in phono amplifiers, covering BJTs, FETs, and opamps as input devices, hybrid phono amplifiers, noise in balanced MM inputs, noise weighting, and cartridge load synthesis for ultimately low noise. A complete chapter on archival & non-standard equalisation for 78's etc. A complete chapter on subsonic filtering, covering all-pole filters, elliptical filters and suppression of subsonics by low-frequency crossfeed, including the unique Devinyliser concept. A complete chapter on ultrasonic and scratch filtering, including a variety of variable- slope scratch filters. Comprehensive chapters on line output technology, including zero-impedance outputs, on level indication for optimal setup, and on specialised power supplies. The final chapter describes six practical projects which range from the simple to the highly sophisticated, but all give exceptional performance.